SUBWAY è un collegamento rapido tra stazioni diverse, differenti ambienti, profumi, colori. Non c’è prologo, non c’è epilogo, ma un nucleo unico, internamente vario: così, il viaggiatore è accompagnato in un percorso di suggestioni dal mondo dell’accademia alle sperimentazioni più disparate, conservando anche un’eco popolare; mentre rimane sempre riconoscibile lo stile originale proprio di Ruggiero Mascellino giunto, adesso, alla sua 31^ pubblicazione discografica. 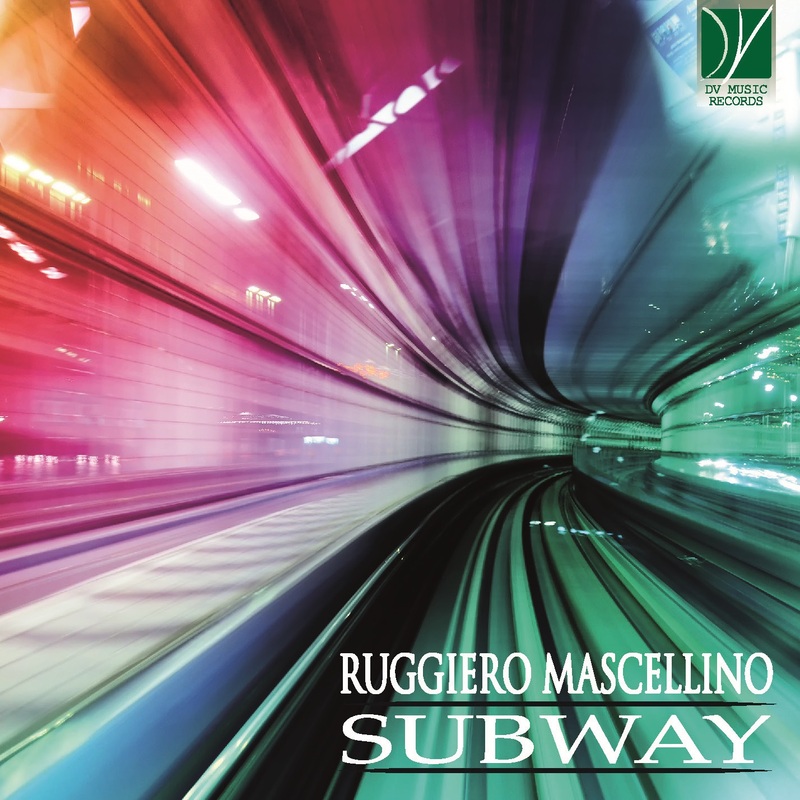 ENGLISH BIO Ruggiero Mascellino (Palermo, 26.06.1973) studied at the "Vincenzo Bellini" Conservatory of Music in Palermo and he graduated in piano in 1996. In 1999, at the "Girton College" of Cambridge, he perfected the study of the piano, then deepening the composition at the Conservatory of Palermo. But the musical passions also spread to other instruments, such as the accordion, as well as the different musical genres that he has experienced over time. Today, Maestro Mascellino is an accordion teacher at the "Vincenzo Bellini" Conservatory of Palermo. From 2002 to 2008 he was an accordion teacher at the "The Brass Group", school of jazz in Palermo. As a teacher he also deals with techniques and improvisation of accordion in the field of popular music, popular music workshops at schools, seminars on the Sicilian dialect and the use of traditional Sicilian folk instruments. An intense dialogue between ethnic, classical, jazz and pop sounds has given life to an original and multiform musical identity: at the moment he has recorded 31 albums of music in his name. With the Teatro Libero of Palermo he has collaborated for six seasons as a composer and performer on stage of the music for 7 theatrical works. As an accordionist he took part in the Teatro Massimo in Palermo at the opera "Vanessa" by S. Barber, at the ballet "Amarcord" by N. Rota and at the concert by Elio & Le Storie Tese. While, as a mandolinist, he participated in the opera "Moses und Aron" by Schönberg. For the Teatro Biondo of Palermo he participated as an accordionist at the "Opera da tre soldi" of B. Brecht and K. Weill, directed by Pietro Carriglio, then staged in several Italian theaters. He has participated as an accordionist, pianist, guitarist and musical director at the shows "Romana - Omaggio a Gabriella Ferri", "Il Terzo Fuochista" by the singer Tosca, with the direction of Massimo Venturiello, which took place in many Italian cities. He participated in the 57th Sanremo Festival with the song "Il Terzo Fuochista", which he wrote, played and arranged, with the collaboration of Maestro Beppe Vessicchio, interpreted by Tosca. He has participated in numerous television and radio broadcasts and events held in various locations throughout Italy. He has curated several concerts of music and popular theater, along with musical arrangements for national and international events. He has performed in several concerts for accordion or accordion and orchestra with some of the most prestigious Italian orchestras: Roma Sinfonietta, Orchestra della Magna Grecia, I Solisti Aquilani, The Sicilian Symphony Orchestra, Orchestra of the Teatro Massimo of Palermo, Sicilian Jazz Orchestra. In terms of collaboration, as well as with artists such as Tosca, with: Eugenio Bennato, Franco Battiato, Nicola Piovani, Rossana Casale, Tullio De Piscopo, Simone Cristicchi, Claudio Baglioni, Elio and Storie Tese, Fiorella Mannoia, Mimmo Locasciulli, Peppe Servillo, Roy Paci. He also collaborated as arranger and pianist / accordionist with the singer Aida Satta Flores, with whom, in 2007, he participated in the show "O 'Scià" by Claudio Baglioni in Lampedusa. He has collaborated with numerous conductors, including Luis Bacalov, Beppe Vessicchio, Sara Hicks, Marzio Conti, Fernando Alvarez, Alberto Veronesi, Pippo Caruso, Jan Latham Koenig, Guven Yaslicam, Simone Bernardini and with Maestro Gaetano Randazzo, performing as accordionist soloist, "Valse et Chanson", "Piazzolla Upgrade", "Four Season", the "Four Seasons" of Piazzolla, also playing with prestigious orchestras from all over Italy and the world. He worked as an accordionist for the soundtrack written by Ennio Morricone in the film "Baaria" by Giuseppe Tornatore, and, as a pianist, with the singer Sting for the concert "Symphonicity" at the Castello a Mare in Palermo. He composed the music of the official spot of Sicily called "Sicilia 365 giorni all'anno", commercial broadcast on all the network Rai, Mediaset, La7, BBC world, CNN and in all Italian cinemas. Recently collaborated as music director, arranger, pianist and accordionist with the singer Tosca in the following productions: "Anima Mundi - sacred music", "Musicanti" and "Zoom..spartito cinematografico", directed by the producer Massimo Venturiello. With the OmniArt Trio, which he is part of together with the masters Massimo Barrale (violin) and Ferdinando Caruso (double bass), he has been included in high-caliber artistic exhibitions, such as Columbus Day at the Rockefeller Center in New York, and in concert seasons in Italy and around the world , performing in particular in Spain, China, United States, Mexico, Turkey, Switzerland, France, Germany, Brazil, Italy. He directed, wrote, arranged and performed the following shows: "Dall'Argentina al Mediterraneo" with the Sicilian Symphony Orchestra, (also for the first edition of TangoFest_Palermo), "iT's in Progress" at the Teatro Massimo in Palermo, "Cuatros Estaciones Porteñas" by A. Piazzolla with the Orchestra of the Teatro Massimo of Palermo. In addition, after collaborating musically over the years at various events related to the celebrations in honor of Santa Rosalia Patrona of Palermo, from 2015 to 2017 he was musical director and official composer of the 391°, 392°, 393° Festino di Santa Rosalia, under the artistic direction of M° Lollo Franco. From 2017 his music is the soundtrack of the great show "Steam" of the acrobatic company SONICS.